5-1/2′ animated Halloween witch with broom is sound-activated. 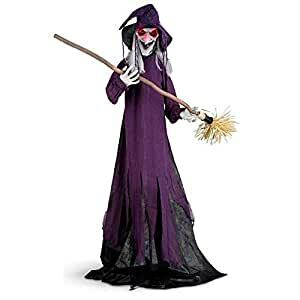 When trick-or-treaters come near, this animated Halloween witch’s eyes will light-up and flash red and her head and arms will move as she utters 5 different scary phrases that are sure to scare anyone who approaches. See full description for phrases. This standing Halloween witch may be used indoors or on a covered porch. NOT meant for outdoor weather elements. Wickedly fun 5-1/2′ animated Halloween witch with broom flashes her evil red eyes. Clutching her broom in her bony hand, this Halloween witch is bewitchingly detailed with molded face, frizzy gray hair, and sound-and-motion-activated. When trick-or-treaters come near, this animated Halloween witch’s eyes will light-up and flash red and her head and arms will move as she utters 5 different scary phrases that are sure to scare anyone who approaches. You’re not going in there, are you? Ahhaaa! I’d turn back if I were you! Aahhahaha. Stand her by your door, next to your hearth, or in a protected location outdoors. Standing 5-1/2 feet high to the tip of her hat, the animated standing Halloween witch requires 3 AA batteries, included.